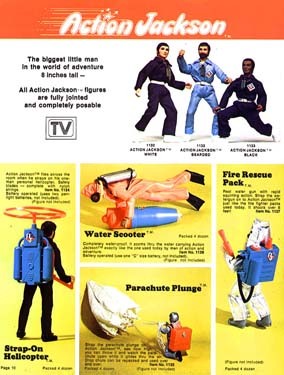 Action Jackson was sold in either dark-blue cotton jumpsuits, or light blue nylon suits. See our preliminary AJ Gallery for examples of the many faces of Action Jackson. These 4 action accessories all work fairly well as gimmicks, and packaging contained the tagline "Really Works!". The Fire-pack squirts water, and the water scooter and helicopter are both battery-operated. The parachute is very large and made of fabric. Repack the chute in the plastic backpack and toss it clear into next week.